Sorry, no matches on eBay for "These Songs Hate You The Crytearions". 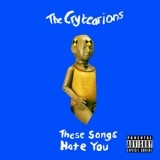 These Songs Hate You is ranked as the best album by The Crytearions. Members who like this album also like: I'll Swing My Hammer With Both My Hands by Cahalen Morrison & Eli West, Guru Overload by Eternal Tapestry and Nico & Her Psychedelic Subconscious by Mr. Elevator & The Brain Hotel. Related links: top tracks by The Crytearionstop tracks of the 2010s, top tracks of 2014.